I'm standing at the summit of Hautacam, a ski resort in the Midi-Pyrénées. 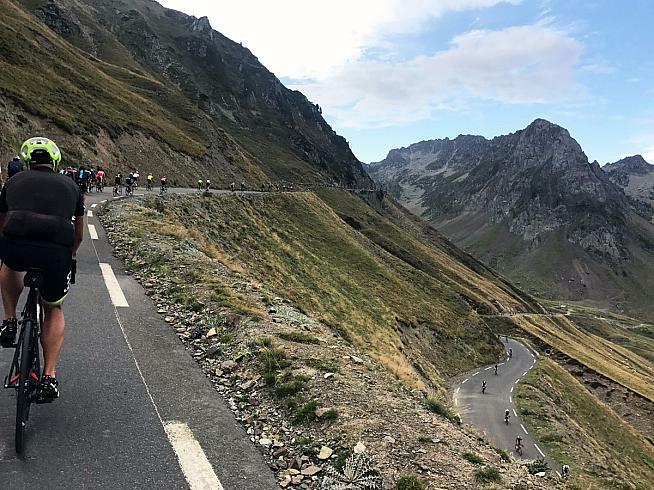 I'm only 1,500 metres above sea level, but I feel on top of the world... having just spent the last eight hours or so bashing myself senseless over five mountain summits to complete the second edition of the Look Marmotte Granfondo Pyrénées. 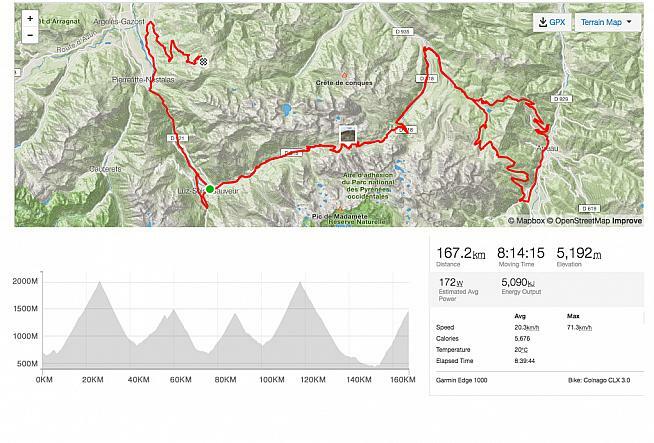 Profile for the 163km Marmotte Pyrénées. 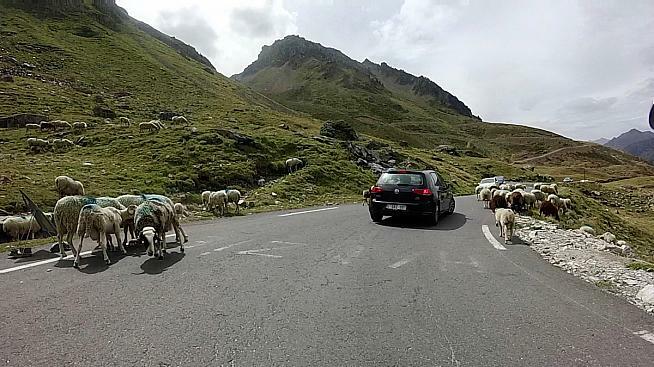 It started some six months earlier, when riding buddy and fellow Sussex Nomad Gary messaged me: "Do you fancy doing the Marmotte Pyrénées... one hundred miles... five mountains?" "I've never ridden up a mountain before, sounds fun, tell me more" was my reply. "Only 50% finished last year" added Gary. "I'm in!" was my brief but decisive reply. My club mates know how my mind works. The big day arrives, and the ordinarily tranquil village of Luz-Saint-Sauveur is packed solid with riders from twenty different nations eager to start the ride of their lives. The population of this French commune has doubled overnight. Unsurprisingly, given the location, Spanish and French riders account for over half the field. The Low Countries of the Netherlands and Belgium are also well represented, making up another third. The remainder have come from all over Europe, aside from a handful of North Americans. With the punctuality of a Sunday club ride, the Sussex contingent of Gary, Kev, Ross and myself arrive with only a few minutes to spare. "Retardataires à l'arrière" is the announcement as we find ourselves passing the queue that begins under the start line banner, meanders out of the village square and into an adjacent car park. We settle at the rear and discuss our plans for the day. I announce that I'm targeting the 'Gold' standard for my age group: nine hours and five minutes. My calculations have given me a target pace of 7.5mph for the climbs, 30mph on the descents with no more than half an hour for refuelling stops. Our conversations are interrupted by the sound of a klaxon, which signifies the beginning of our epic adventure. Riders stream over the start line in one massive peloton rocking out to the appropriately chosen soundtrack of 'Hells Bells'. A couple of minutes later, we roll over the line as the last few beats of this classic AC/DC track start to fade away. It would be some ten hours before I see Gary and Kev again, but I keenly follow Ross's wheel in anticipation of drafting him up the first mountain. We don't have to wait long. After a gentle four-mile loop around the village we commence the ascent of the mighty Tourmalet. 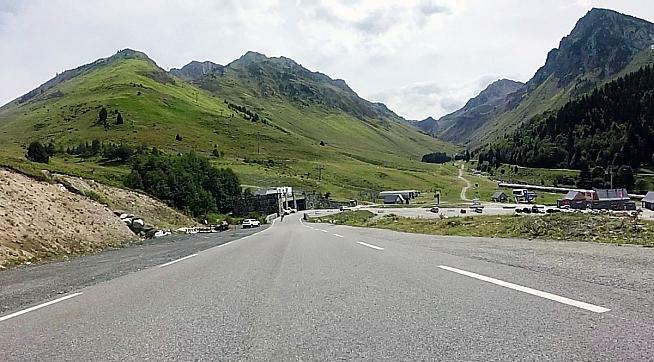 At 2,115 metres it's the highest paved mountain pass in the French Pyrénées and this first ascent, from the western side, is over 11 miles (18km). 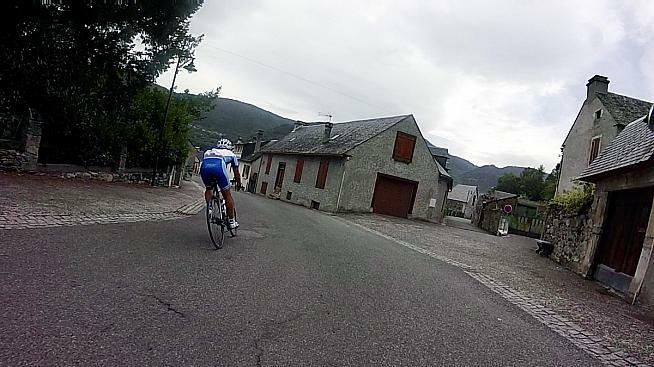 It's the longest climb of the day with an average gradient of 7.5%, creeping up to over 10% nearer the summit. I'm still on Ross's wheel, but I feel the pace is too fast so I hold back and settle into my own rhythm. Unbeknown to me, I pass him about a mile later, but with so many riders massed on the road I don't notice. It's going well, I'm averaging 8.5mph. It feels good to be riding up a mountain for the first time and to be overtaking so many riders; not quite my usual climbing speed, but I'm pacing myself for the long day ahead. It's mind-boggling stuff. A long climb back in Sussex is only a mile or so... this animal is almost twelve times as long. The French very kindly provide signposts every kilometre along these classic climbs, indicating the distance to the summit, elevation and average grade for the next kilometre. The first seven seem to pass quite quickly as civilisation is left behind and the stunning Pyrénéan views start to kick in. About half way up the mountain, the first set of hairpin bends can be seen rising skywards with a trail of cyclists snaking up the gradient. I feel blessed, these are the sights I have been looking forward to and I am not disappointed. Left, up, right, up, left again, right again... I'm on a high. I look down to the valley where I've just come from and I see a long line of riders following me up the ascent and remember thinking that life doesn't get much better than this... then I pull a Chocolate Almond Fudge bar out of my back pocket and realise that it just did. A lot more twists and turns come and go, the kilometre milestones tick by and I'm in my element having the time of my life. One final bend and there it is... the famous 'Giant of the Tourmalet' statute appears. I've made it, my first ever hors catégorie climb. It's taken me an hour and 22 minutes, but the feeling is immense. No time to rest though, I'm straight into the long descent down to Sainte-Marie. Against all pre-event advice, I decide to leave my jacket in my pocket and brave the wind chill. I barely notice as the severity of the first slope and initial hairpins immediately grab my attention. This continues for the next few miles; I'm a bit nervy as I struggle to cope with the combined ferocity of the gradient and this narrow winding road. My brakes are getting a good workout, my fingers start to ache and tension spreads up my arms, through my shoulders and all the way down my back. Some twenty minutes later, I'm in the valley and feel safe having plummeted off the mountain at way above my target pace. Stunning views greet riders throughout the course. Mountain number two arrives almost immediately. The climb up to Hourquette d'Ancizan is a merciful 4%, but combined with the slope up from Sainte-Marie it's over 10 miles (17km) long. The pace is still high though, I'm exceeding my 7.5mph plan and the mountain helps out with a short descent eight miles in before kicking up again to the summit. In a UK sportive, I can usually make my dual 750ml water bottles last a century. Not today though, I'm barely 40 miles in and I pull over to top up my bottles. Time ticks away as I queue for water to find that the taps are in collusion with the clock, being in no particular hurry to fill me up quickly. Suitably refreshed; how about another descent? This one is not as steep, the bends are not as harsh and my confidence returns. The descent off the mountain is only five or so miles (9km), takes just over 10 minutes and is followed by another three miles (5km) of shallower descending to the base of the Col d'Aspin... mountain number three. Traffic-free villages are a joy to whizz through. This is the shortest of the day; a mere seven miles (12km) with an average grade of 6.5% it meanders like a true mountain road. I manage to ride this bout of climbing at a steady 8mph in what will prove to be my only sub-hour mountain of the day. The top of the climb marks the halfway point in today's adventure and I arrive at the summit with my bottles empty once more. The same tap trickle procedure follows as my legs appreciate this well-earned rest. Another glorious descent follows; eight miles (13km) this time and once again my confidence grows and my descending form returns. There are a few junctions on this descent, but unlike a UK sportive we do not need to stop or even slow down. The event organisation is outstanding as every junction is covered by marshals stopping the traffic to let us through. The roads aren't closed, but they might as well be. 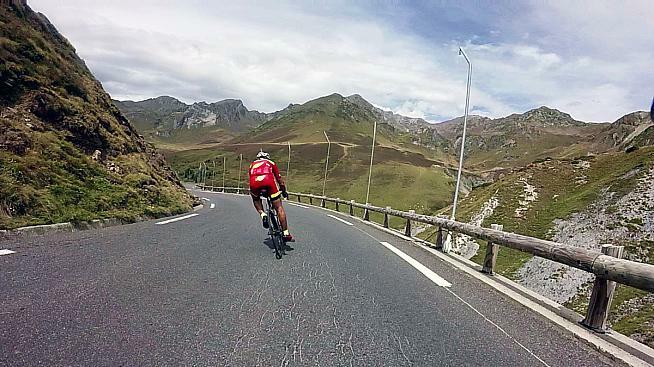 A few miles in the valley and there it is... exactly where I left it two and a half hours ago... the mighty Tourmalet. This time it's the eastern approach. A gruelling ten-and-a-half-mile climb made even tougher with the temperature now well into the mid-twenties. I knew this was coming, and I was dreading it. Maybe this fear got into my head as I was struggling early on; the first signpost cruelly displays 17km to the summit, commencing the countdown of the longest ninety minutes of my life. The gradient for the first five signposts is reasonably shallow; it starts kicking up by the sixth, and by number seven the climb starts to impose its might as it attempts to defeat you with long stretches over 10%. I'm in the saddle, I'm out the saddle, I can't settle into any rhythm and my struggle is confirmed as I attempt to change down to my granny gear only to realise that I'm already in it. My climbing speed is now down to below 7mph and riders are passing me. No one is talking; lots of grunting... but no talking. The silence is broken through the village of La Mongie, a ski station during the winter but today small clusters of tourists clap and cheer us from the roadside. A group of children high five the riders, my turn gives me a lift, but it only lasts a few seconds as reality kicks back in and the suffering continues. 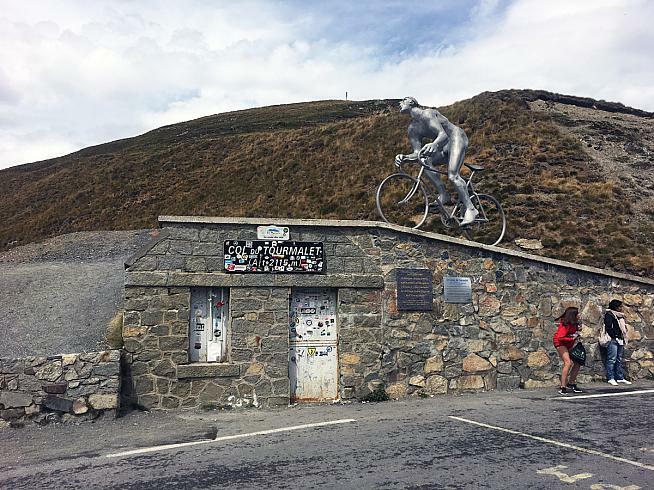 The second ascent of the Tourmalet. If the mountain wasn't hard enough, Mère Nature joins in the torment by sending us some rain. This, however, is a blessing. You can't beat a nice cool shower when you're suffering... suffering like you've never suffered before. The gaps between the kilometre signposts seem to get bigger and bigger, but eventually the glorious sight of one to go appears. I know I can make it now. A few more bends are rounded and I can see the holy grail of the feed station rolling ever closer as I begin to smell the food that awaits. How I managed to get to the summit of this monster without stopping is beyond me. I do not know where I got the willpower from to keep going. My reward is a fifteen-minute rest and some proper food. A few handfuls of ham, cheese and bread makes a welcome change to the sugary bars and gels I'd previously been binging on since breakfast. Now for some exhilaration... the long, fast downhill stretch back to Luz-Saint-Sauveur. It feels like I'm demolishing a sand castle that I've spent all day building... the descent off the Tourmalet takes a mere 23 minutes, an hour less then it took to climb this beast some seven hours earlier. I manage long stretches at 40mph, which includes a gravity-assisted 10 mile PB of 18 mins and 44 seconds. A flock of sheep in the road temporarily halt my progress, but this just adds another dimension to an awe-inspiring descent. Talking of awe, riders who must be reaching speeds in excess of 50mph are overtaking me... it's breathtaking. 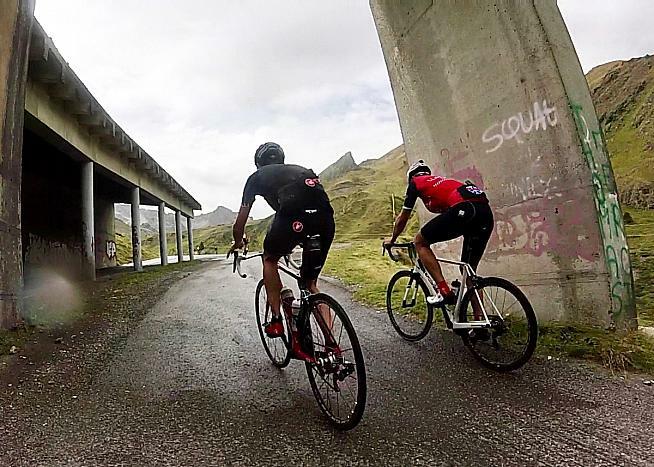 The speed slows to a more sedate 20 to 30mph through Luz-Saint-Sauveur and all the way down to the foot of the Hautacam, where the dreaded last instalment of pain is due to commence. Enjoying another exhilarating high-speed descent. The first sign announces the daunting prospect of 13 kilometres (8 miles) to the summit. The average grade is 8% but with long stretches into double figures it's a brutal climb to put at the end of the day. As if this wasn't hard enough, the mercury has risen to 30 degrees for the first time today... welcome to the Hautacam... or the 'Haunt'-acam as rebranded by my subsequent nightmares. The lower slopes are a breeze as I start to get my mojo back after recovering on that ridiculously long descent. My overconfidence however, leads me to ditching some of my water in an attempt to lighten my load... further up the mountain both bottles are empty and the sufferfest makes a comeback. Six kilometres to go and the main digit on my Garmin ticks over... 99.8... 99.9...100... another century for my collection. I'm usually ecstatic at this point, but I'm on my knees with four miles of downright brutal climbing to go. Five kilometres to go and I'm starting to lose the will to live as I grind out what little I have left. Quite a few riders are walking now but I'm not going much faster as my pace drops to below five miles per hour. Four kilometres to go and I'm out of water, out of gears and out of the saddle. I inexplicably lose the ability to count as the three kilometres to go sign appears. "What!" I exclaim to myself, I was expecting two to go... I'm distraught and I'm disoriented. I can no longer pedal; I grind to a halt and stop. With my aching body hunched over my handlebars, sweat drips off my face onto my front wheel. There might well have been some tears in there as well, I'm devastated... for the first time today the Pyrénées had delivered a hefty blow and floored me. "How did this happen?" I ask myself. "I'm good at climbing... in fact I love hills..."
"Exactly!" I scold myself "...now, snap out of it!" I take a moment, swallow my last gel and remount to show this mountain that I will NOT be defeated. "C'mon...!" I roar myself back into action. The two kilometre sign finally appears and I'm starting to get some energy back. Then the most magnificent sight of the day... one kilometre to go! My grimace is replaced with a grin, endorphins kick in and see me through the last two hairpins and the sweeping right corner into the summit's car park. The climbing-fest is over... it's a flat last hundred metres to the line. I have absolutely nothing left so uncharacteristically roll towards the line and slowly creep under the finishing banner. It's been eight and three-quarter hours since leaving la ligne de départ; over a hundred miles have been ridden and five mountains have been conquered... I'm exhausted and euphoric all at the same time. Now, where's that GOLD medal? Strava only tells half the story. 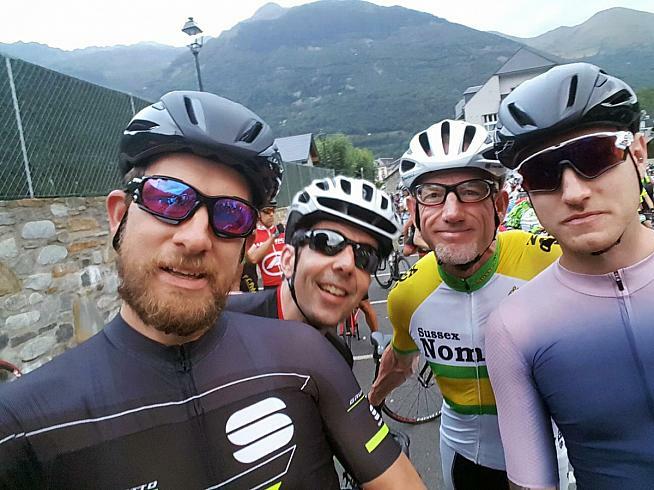 The Look Marmotte Granfondo Pyrénées returns in August 2018. For more information and to book your place visit marmottegranfondoseries.com.